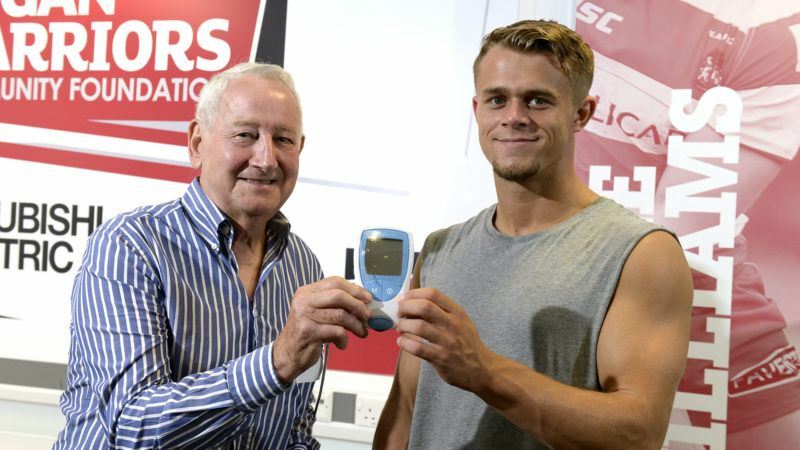 The heart of the Wigan community Wigan Warriors are using their strength to spread the word about a warfarin home monitoring service freely available to patients in the town. The warfarin home monitoring service is powered by Inhealthcare technology. The Warriors are strong believers in using technology to improve health and well-being and recognise the real benefits of this service for the community. Mark Bitcon, Head of Performance at the club, is aware of the importance of developing healthy habits, as a healthy player makes a good player. The club uses the latest digital technology to monitor the fitness of players in preparation for the First Utility Super League. Pictured above, player Dom Manfredi and coach, Shaun Wane were excited to team up with anticoagulation nurse, Angela Abbott and patient John Binks to help to improve local health and wellbeing. John Binks is a brilliant patient advocate of the service, illustrating how INR self-testing can provide patients with a lifeline and support them in achieving positive outcomes in their health and well-being. Wigan Borough Federated Healthcare GP federation is offering the digitally enabled service through its 15 GP surgeries, with the aim to enable warfarin home monitoring for at least 4,000 patients. The warfarin home monitoring service enables patients to self-test their INR at a convenient time and place, reducing the burden of regular clinic attendance and giving patients the freedom and confidence to manage their condition. The NHS is running an awareness campaign over the next few weeks. This will begin on Saturday 25th June with the help of the Warriors at the big match against Castleford Tigers. NHS representatives will be handing out leaflets with more information about the service ahead of kick off at 17:30pm. The same again will be happening at the Warriors match against Wakefield Trinity Wildcats on 8th July, kick off at 20:00pm. People who are interested in the INR self-testing service in Wigan can sign up at www.warfarin-at-home.co.uk or find out more at the patient awareness day being held at the club headquarters 20th of July. Here patients will receive training, meet patients including John Binks and have the chance to win 1 of 5 signed Wigan Warriors shirts. Whilst patients in Wigan are able to benefit from warfarin home monitoring, I believe that this service should be offered to the wider population of patients. The vision for this service is a nationwide roll out, enhancing patient care for the 1.2 million warfarin users whilst enabling much needed pressure alleviation on NHS services.